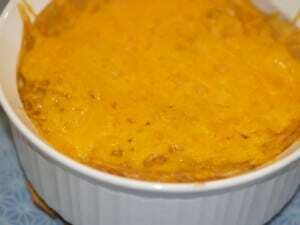 This is a creamy Tex Mex casserole that was made famous by the King Ranch. At one time the King Ranch was one of the largest Ranches in Texas. This is a great recipe to use leftover chicken and corn tortillas. Best of all you can make this casserole ahead of time, as it heats and reheats well. You can turn up the spice on this casserole by adding more jalapeno peppers and a touch more of the chili powder. Don’t miss out on this Southern classic. King Ranch Casserole is a classic casserole that contains lots of chicken, corn tortillas, all in a spicy cheese sauce. Cook onions and garlic in 2 tablespoons of cooking oil until they are tender. Remove from heat and stir in pimiento, chilies, and jalapeno peppers. Set aside. Cook tortillas one at a time, in about 1/4 inch cooking oil in a medium skillet until tortillas are crisp, turning once. Drain on paper towels and set aside. Melt butter in another saucepan. Stir in flour, chili powder, oregano, salt, and pepper. Add the chicken broth all at once. Cook and stir until thickened and bubbly. Cook and stir for 1 minute more; remove from heat. Stir in sour cream. Arrange six of the tortillas, over lapping slightly, in an ungreased 3 quart rectangular baking dish. Top with half of the chicken, and half of the cheese. Repeat layers. Cover loosely with foil. Bake in a 350 degree often for 35 to 40 minutes. Let stand for 10 minutes before cutting. Makes 12 servings. So where does the mixture of onions, peppers, etc and sauce come into place? you don’t have the chicken listed in the recipe. Does it go in with the chicken broth mixture?